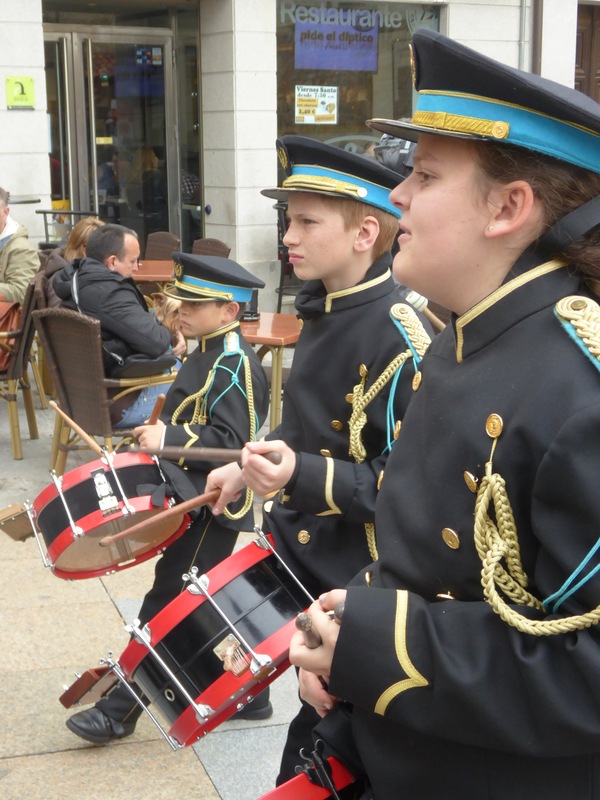 Today: a uniformed band of young boys blowing instruments (sort of in tune) and happily banging drums in a central area inside the wall. The group included some very young boys. 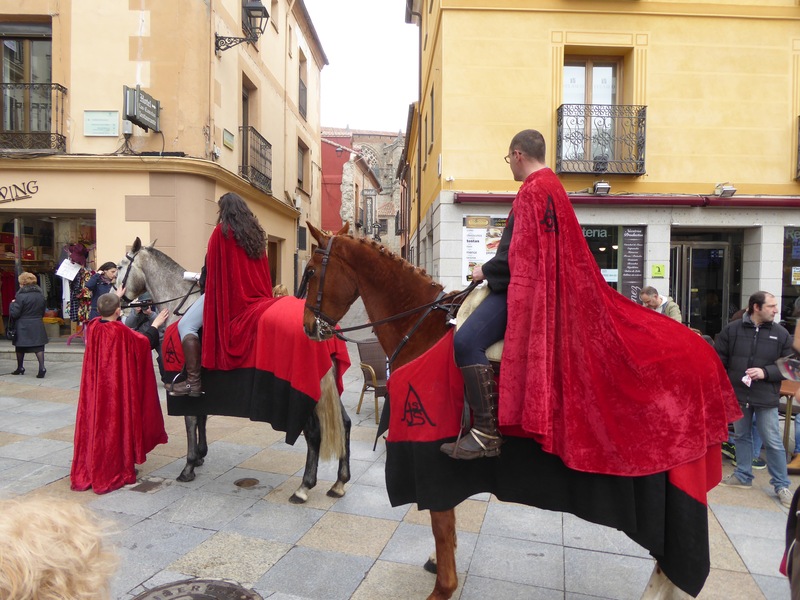 The boy band had two horses with it with their caped riders and two caped assistants. When the playing stopped, the woman rider opened a scroll and read a notice about the sermon on the six words, at 12.00. I saw this group stop, and her read twice, within a few minutes of 12.00. Why? Who knows. Her horse had to be carefully reassured by the younger of the two assistants and later the bigger one had to help too by holding the bridle. It looked like a disaster in waiting in a moving crowd along with the noisy boy band. Her being barely audible added to the intrigue. Like having someone with laryngitis re-enacting the actions of a town crier from long ago. And later: tuk tuks rule! 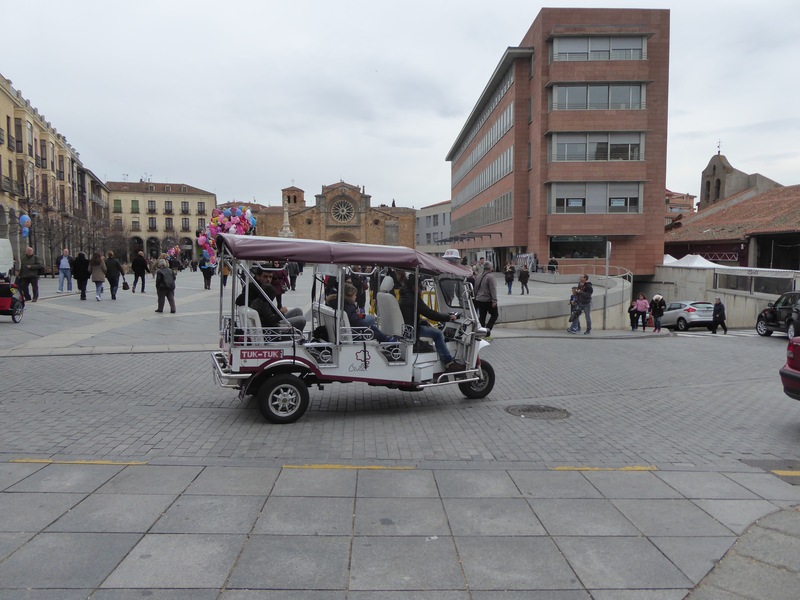 Even Avila has some, for carting tourists around. This plaza is just outside the beautiful town walls. A charmless area with an underground car park and where a different building code applies, clearly. After much thinking about what to do I’m headed on Sunday, by train, to Arevalo. This town is on the Camino Levante on the way to Zamora. I’d have been disappointed if I didn’t get to Zamora this trip. Not sure how much walking I’ll do after Arevalo. Lots, I hope. It will depend on the weather. The good news is Arevalo is a few hundred metres below the magic 1,000m snow line. 50km from here, it also sounds interesting. This whole region has been so strategically important in Spain for centuries. Helped of course because Isabella, the Catholic queen from the 1400s, spent time round here. 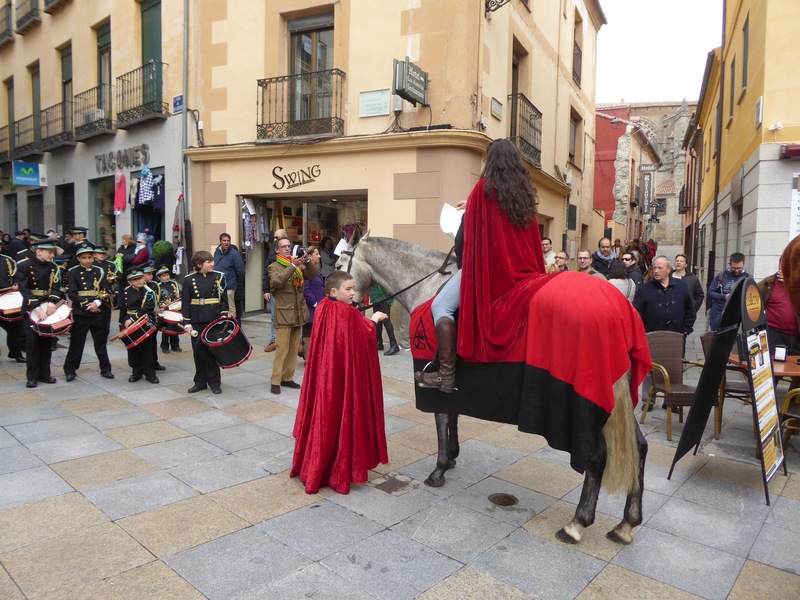 She was recognised as the regal heir where the big Toros de Guisando are, went to school in Avila (I think), and apparently favoured the area in response. If I knew more history I’d also know how important here must have been to the Romans and possibly the Neolithic tribes in Iberia. Even more recently, there is clear evidence along the Camino track of it long being important agriculturally. Lots of long gone stones houses with their orchards and the remnants of extensive stone fencing. I bought a train ticket today. There were two windows at the station for ticket sales, one shut. The open ticket window, with no customers, only sold tickets for that day, according to signage. The other window sold tickets for trips on future days and reopened in an hour. Ok. So I went to the ticket machine. Got to the end part and it spat out my €10 note. Twice. Went back to the today-only window. The woman in that window sold me a ticket for Sunday! I’m sure this was to avoid explaining the reasons why she couldn’t sell me a ticket although the machine wasn’t working and she had no other customers. Phew. Just lucky. Thought I’d have a light supper instead of dinner. But, it was after 5 and so soup was off until 8.30pm. Nothing but a cheese plate. Three very thin straws, six very very small slices of very nice cheeses. But small! 9€. So I’ve found a challenger to the Qantas cheese plates. Qantas has larger wedges but none has a distinct taste. The Paradore has smaller but nicer bits. I wouldn’t recommend either but I never learn. Why not eat in the restaurants nearby? This city is very busy and restaurants are still full with many finishing lunch. Still. The umbrella I was given proved its worth today: it stays up perfectly as long as there is no breeze or any rain drops. A hint of rain or wind and it sags down. I bullied it into staying up as the rain stopped. This confirms it was dumped by a savvy owner over its peculiarities and unwillingness to do its duty. I am looking forward to tonight’s. It’s a female confraternity, the Confradia de la Soledad (a direct translation is the ‘consorority of the lonely’) and the members wear black with a mantilla. I wonder if it relates to an earlier war and the number of women alone with men away or dead. Just wondering. The name certainly doesn’t suggest it’s their widows. I saw a photo of their costume earlier and am very pleased to have a chance to see it in use. 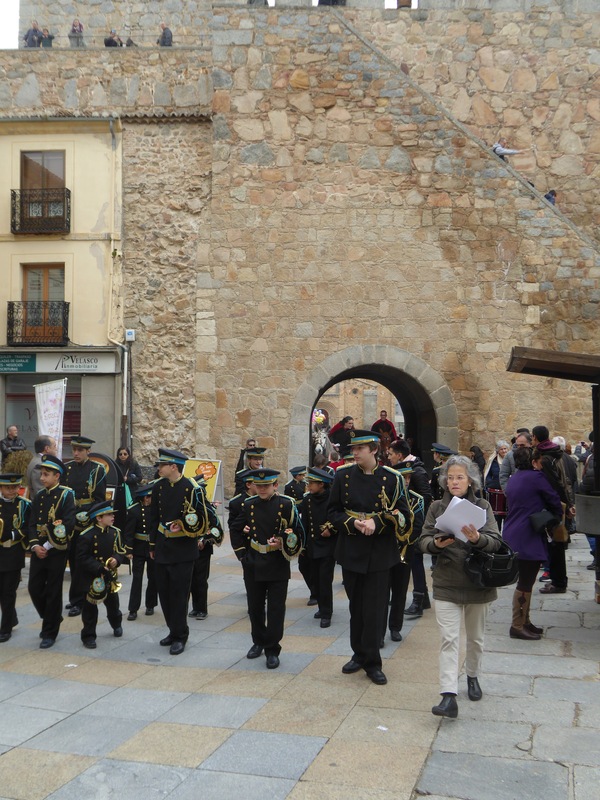 Also, this procession starts a little earlier so the light may be fraction better for taking photos. First, I have to figure the route as its not in the old town, but just outside it. This changes in Spain tonight, one hour back. That will mean sunrise at about 8am for a few days. Then it will rapidly move earlier. Pleased you found your way forwards. 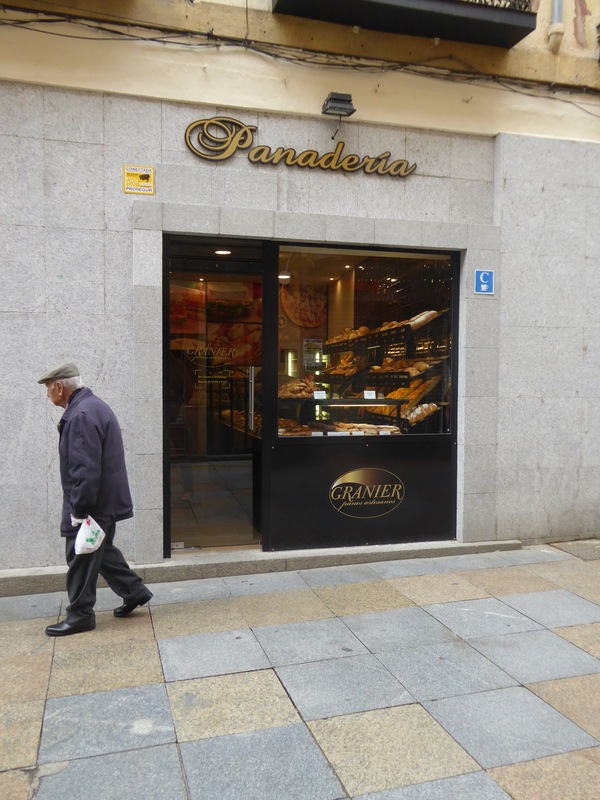 And the Panaderia ….